Despite considering myself a zoologist who happens to work on dead things, rather by default of my jobs I know quite a few geologists. Recently I was chatting to my old buddy Mat Watson from the University of Bristol while the poor guy was stranded in an anonymous US airport trying to get home from some fieldwork in Hawaii (ah, the hard life of a volcanologist). The subject turned to a dinosaur news article Mat had seen concerning ceratopsians and I mentioned that really, that had nothing on the nyctosaurs and on showing him a picture, his reply became the title of this post. Yes, this time we are on the nyctosaurs, those fantastic aeronauts with the best (and certainly the most improbable) headgear of probably any animal in history. They really don’t get much attention as other pterosaurs which is a shame for several reasons which will become clear shortly, and typically just goes to show the inherent human bias against things which don’t *look* interesting, even if they *are* interesting. Nyctosaurs are, according to most researchers, close relatives of Pteranodon and certainly Nyctosaurus and Pteranodon overlapped in time and space being found in the Late Cretaceous Niobrara chalk for Kansas and nearby states. They might be more distant relatives, but however you spin it, the nyctosaurs are derived pterodactyloids of some kind and linked to the ornithocheiroids. 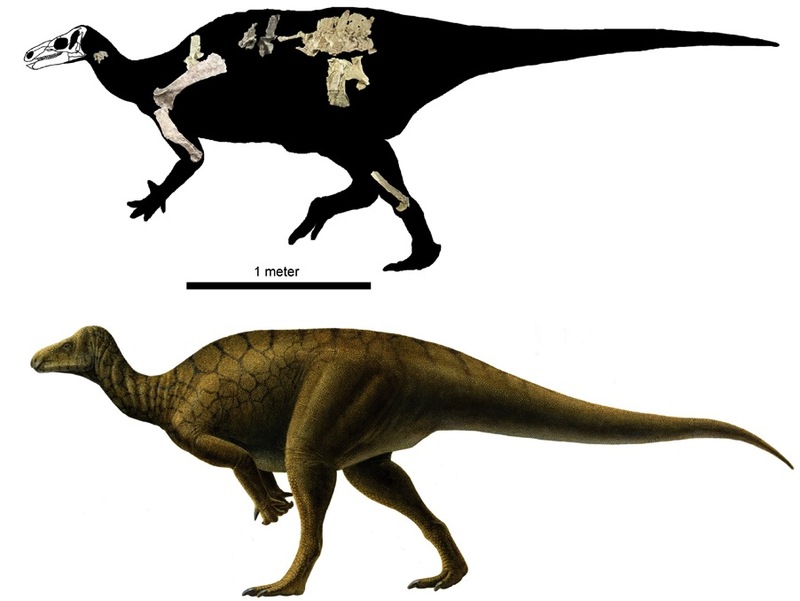 They lived in the Late Cretaceous and are so far only known from the Americas, with Nyctosaurus coming from Kansas and surrounding areas and Muzquizopteryx (previously seen here thanks to the ossified tendons of the arms seen in the group) being Mexican. Yep there are currently only two genera known for this group which is, well, not many really. Like the (other?) 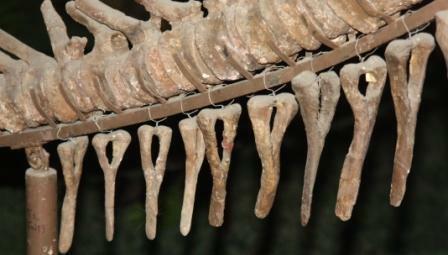 pteranodontids and the azhdarchoids, the nyctosaurs are toothless and had long jaws capped by a beak. Given their location, they were presumably ocean-going fliers and piscivores, though we don’t really know for sure it’s a reasonable inference. They are, for Late Cretaceous pterosaurs, also rather small – only around 2 m in wingspan so less than half that of Pteranodon for example. Nyctosaurus is, these days, famous for the quite extravagant forked crest that adorns it’s skull, though this was only discovered pretty recently thanks to two rather controversial specimens (though, I should add, not the research). 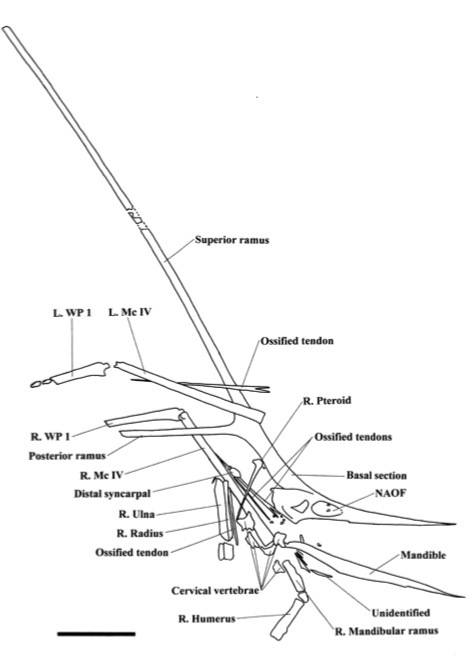 Previously, Nyctosaurus was thought to only have rather a nub of a head crest like that seen in Pteranodon ‘ingens’ (now widely considered a female morph and not a separate species) and indeed in the sole specimen of Muzquizopteryx. Nyctosaurus specimen KJ1 from Bennett, 2003 fig 2. Nyctosaurs have another, rather more unusual morphological characteristic to go with the occasional giant crest. They have no hands. Or more specifically, they lack both digits 1-3 and the corresponding metacarpals. The wing finger is there, or course, and the enlarged fourth metacarpal that it sits on, but the others have gone. This took a long time to confirm as while suspected this is of course and absence issue and it’s hard to prove that something is genuinely missing from an animal’s anatomy and not just not present in the specimen. In this case it was the recovery of multiple arms (including complete ones) with never a trace of any fingers apart from the wing. 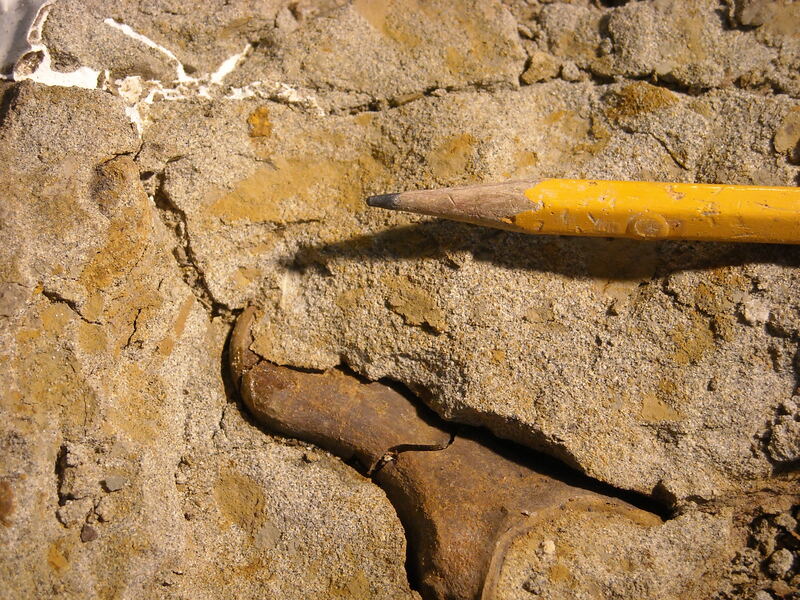 It’s highly unlikely that these bones were repeatedly the only ones to go missing during decay or disturbance, especially when a complete and articulated wing or whole skeleton is otherwise present. This actually fits with the inference of a highly specialised ocean specialist that landed only occasionally and so simply didn’t need those fingers for walking or clambering around. That’s the real basics of the nyctosaurs laid out, we actually really don’t know much about them as there are few good specimens and only two genera going and much of what has been sorted out or is especially interesting has only been learned recently. There is surely more to come and given the plethora of azhdarchoids that have turned up recently it’s a bit of a surprise and rather disappointing that only Muzquizopteryx has appeared to add to Nyctosaurus, but my guess is that it is only a matter of time before more taxa arrive on the scene and I have heard rumors at least of others. Finally thanks to John Conway for letting me use his awesome video of a Nyctosaurus flock in flight. I have somehow managed to all but avoid mentioning chevrons on the Musings before so it is about time I redressed the balance, though I don’t think even their strongest supporters (if indeed there are any) would claim that they are exceptionally exciting bones. These are the small bones that sit below the tail vertebrae in most archosaurs (they’re missing in birds and some pterosaurs) and reptiles in general. There’s a fair bit of variation in size, shape, and distribution and I’ll not be going into any great detail (as ever) but they are the kind of thing that often gets overlooked and so even covering the very basics will likely be of interest. Chevrons are absent from the first few vertebrae since this is still part of the main body of the animal as can be seen by the position of the pelvic bones, and so they only arise where the tail starts to be free of the rest of the body (essentially, posterior to the cloaca). It’s been suggested that females might have one or two fewer chevrons than males since they would not want this to interfere with egg laying but there seems to be no correlation of this in extant reptiles and thus where differences occur it’s likely merely a result of intraspecific variation than sexual dimorphism. Chevrons are paired one to one with the caudal vertebrae they hang beneath (though as noted above, they are usually absent from the first few caudals, and indeed often the last ones as well – this can be quite a number in the case of things like diplodocids). However, they can articulate with either a single vertebra, or at the junction between two vertebra. They typically have some form of Y or U shape when seen from the front or back since between them and the vertebrae runs the caudal artery and vein of the tail. Thus the chevrons provide some protection for these blood vessels rather than having them hang free under the tail (mammals have the ‘haemal arch’ which is effectively formed by the fusion of chevrons right onto the caudals). The lower part of the chevron really shows the variation though with some having a slight anterior process, many having a long posteriorly facing one, other extend vertically, and on occasion you can get really unusual ones (like in dromaeosaurs tails). There can be quite a bit of variation along the row of even a single tail too, and obviously the chevrons get smaller towards the end and are typically absent for the very distal tail, and there is a general trend for the more distal ones to be less morphologically complex. I’m pretty much out on chevrons, though I managed a few hundred words more than I expected. Coming next, oh, something on archosaurs I’d imagine. The one and only Mark Witton takes to the stand today. Mark is of course a researcher in his own right and regular blogger on Pterosaur.net and indeed has a Flickr page full of his artwork and ramblings. 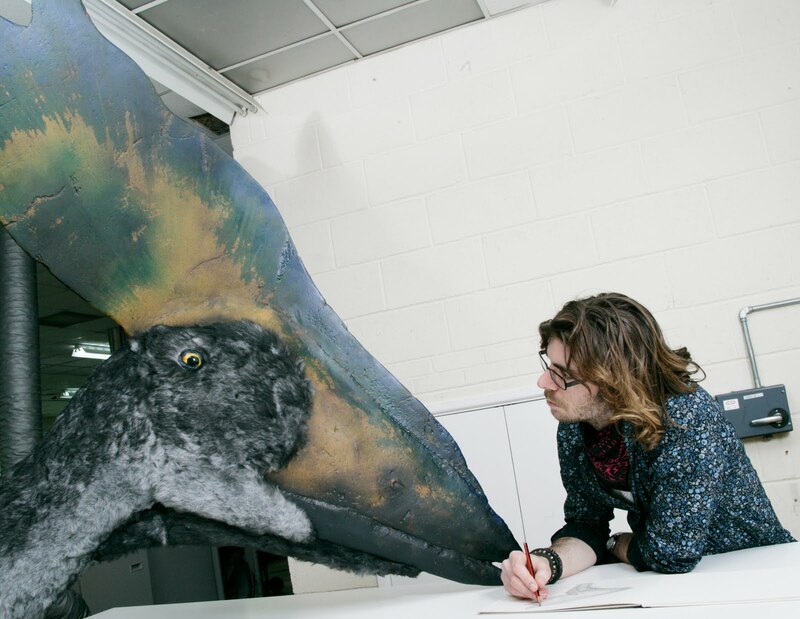 In just a couple of years he has accelerated into the palaeoart scene with his works cropping up in all manner of papers and press releases and of course his model-making skills were put to the test with the creation of the great pterosaur exhibit of old London town. Here Mark divulges on his art and provides two brand new images as well! While best known for his computer generated / coloured images he’s a mean model-maker and pencil-sketcher too as you can see below (all images are Mark’s property etc.). 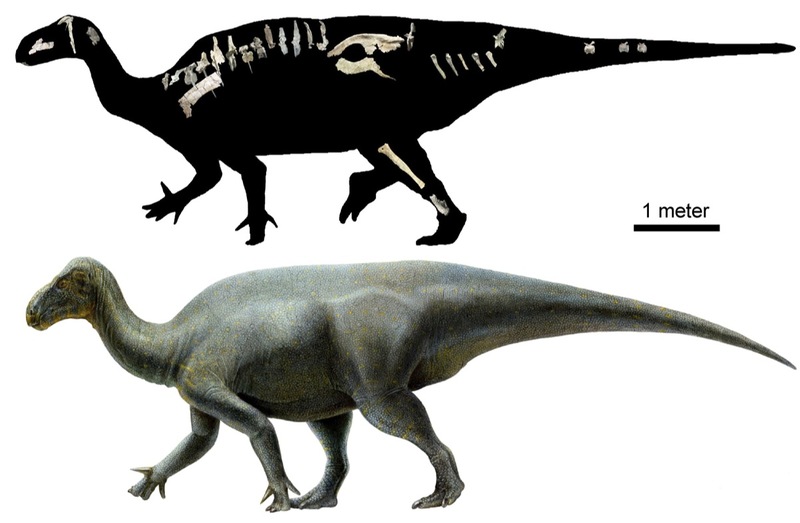 So everyone already knows about the two new igunaodontians that are out there, Hippodraco and Iguanacolossus. I’m a bit late to the part with all the palaeoart stuff going on, but I did promise Jim Kirkland, Andy Milner and Don DeBlieux that I’d blog about it so I’d better had. The paper is in PLoS One and so is freely available here who want to see it. This of course follows hot on the heels of Kukufeldia, and Darren Naish’s review of the last two years of igunaodontian taxonomic revisions and the host of newly erected names. Everyone has gone on about the year of the ceratopsians but these guys have had a good 2009-10 as well. Given the coverage of the new taxa, I really will cut things short here as there is little to add to the host of other blog posts. However, Jim was kind enough to send me a ton of images some of which I have not spotted on other reports so I’ve dropped them in here for your edification. Congratulations to Jim and the team and best of luck with future finds. What another one, already? Yes, the palaeoart section of the Musings is expanding again as this time Mike Skrepnick talks us through his artworks. As ever these are Mike’s property etc. and you can see still more lovely pictures over on his website. This update covers November 17-18. 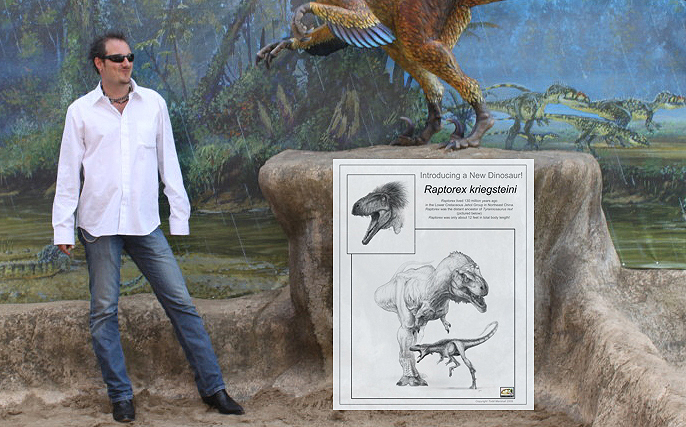 There have been a major development on the Gorgosaurus project. Some people are having trouble figuring out how a femur could end up near the head so in this posting I include a rough schematic sketch I made on Nov. 17th showing the rough placement of known bones and presumed ones. 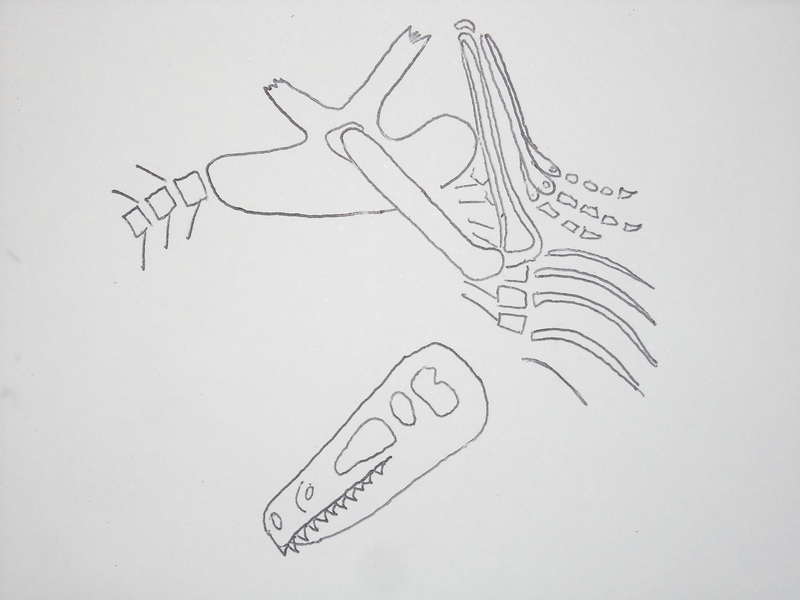 When the drawing was done, the presence of a tibia and hind foot were not known but presumed- more on that later. Work on the 17th confirmed the presence of a femur and fibula. 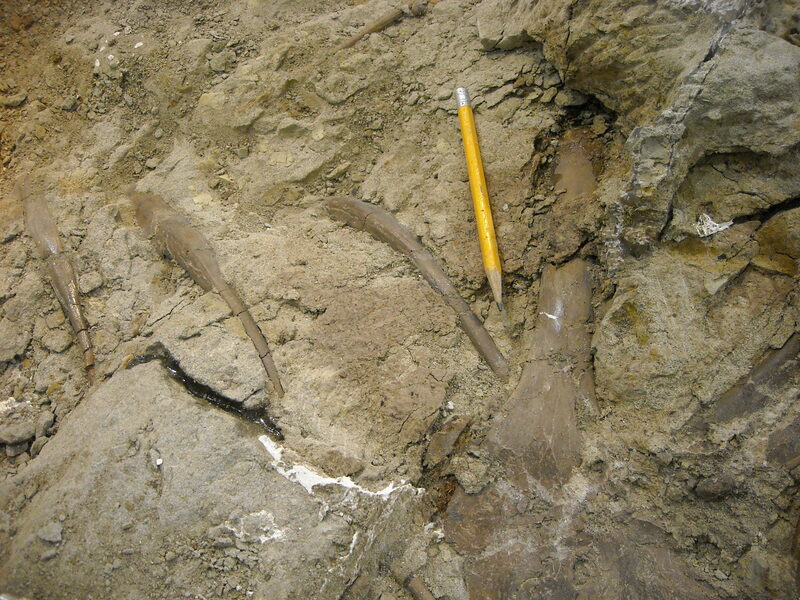 The bone in both (femur especially) was well preserved in many places, but badly shattered, splintered and collapsed. Other places the bone is like a completely dried out chocolate cake and just as crumbly. It truly is awful bone to work on, but fortunately all the pieces are still in place or nearly so and the rock comes off the bone very well. In the last posting I briefly discussed 2 ton epoxy glue and in this posting I want to detail some common sense approaches and tricks I have used with epoxy glue in the past and have/will use on this Gorgosaurus. 1. 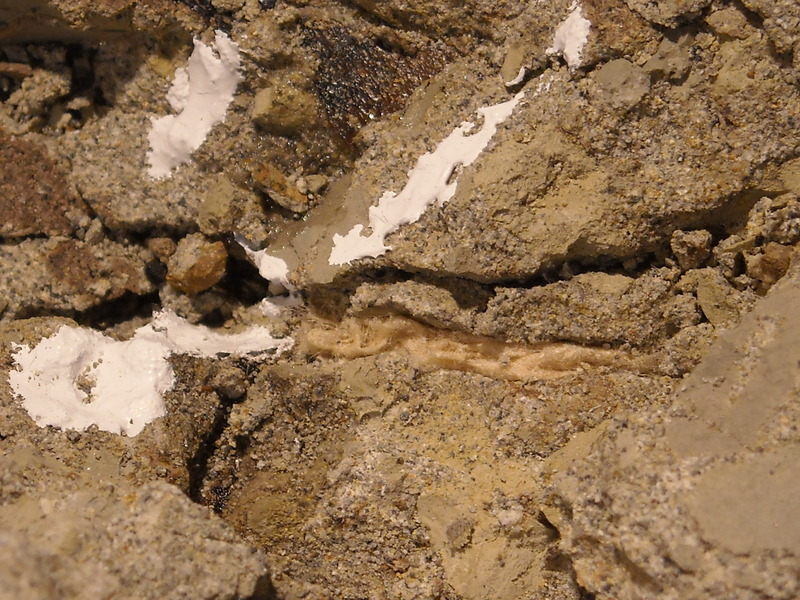 When using glue to fill cracks in bone or in the rock (or both), slowly pour the glue in at one end of the crack (usually the widest end) so it flows along driving the air in the crack ahead and out of the way. Simply pouring the glue into the crack can form large trapped air pockets of bubbles, weakening the join. Always pour at one end and let it flow along. 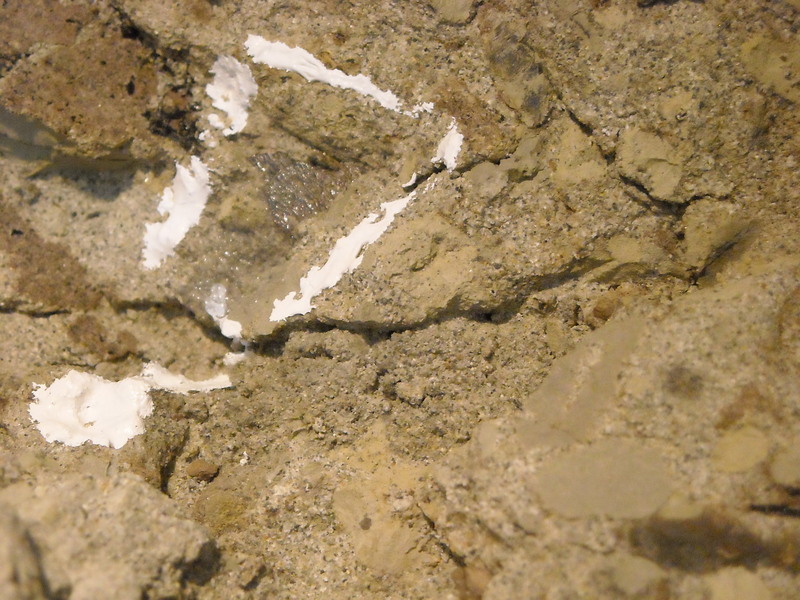 If it is an angled but nearly horizontal crack, pour at the higher end, taking care that it does not flow out the lower end onto bone surfaces. 2. For a shallow pour, cram the bottom of the crack to the depth desired with packed tissue paper, then pour the glue in. Alternatively, you can mix the glue, wait until it begins to cure then pour the thickening glue into the crack. If the crack is two-sided with a vertical crack and a horizontal one, the poured glue will escape out of the vertical crack. Plug that off with tissue paper crammed in or use putty/plastecine to hold the glue in. I prefer the tissue paper technique. 3. If you find the epoxy too runny, you can thicken it up. Much like adding flour to gravy to thicken it, you can make the epoxy glue thicker by adding various inert materials. Materials such as clean sand, powdered glass (which may give the epoxy an unwanted white color), chopped strand (short lengths of fibreglass) can be mixed in. Another way to thicken the glue without adding other materials is to chill it in a fridge first, mix it up and then pour. It will still set, but will take its time doing it. 4. If you want the epoxy to be colored, the best way is to simply stir in powdered tempera paint until the desired color is achieved. The wet color of the paint/epoxy mix during the mixing phase may be different from the dry and hardened epoxy, so advance testing should be done. 5a. Epoxy, like any fluid, will follow the path of least resistance. If the glue is not flowing where you want it to, then raise the fossil or specimen jacket on one end and block it up with lengths of wood, or, being very careful, tilt the table slightly. 5b. Another trick is to use your airscribe. Air blows out the tip. On a low setting, this air can be used to push around and steer the glue to places where you want it to go. 6. Epoxy curing is a chemical reaction, so if you want, a desk lamp can be aimed close to the setting glue and the warmth from the bulb help speed up the curing time. Don’t put the lamp too close- just close enough to keep the work area warm. This often works for other solvent-based glues too, especially those using acetone. As with any new technique, test on a safe area first. 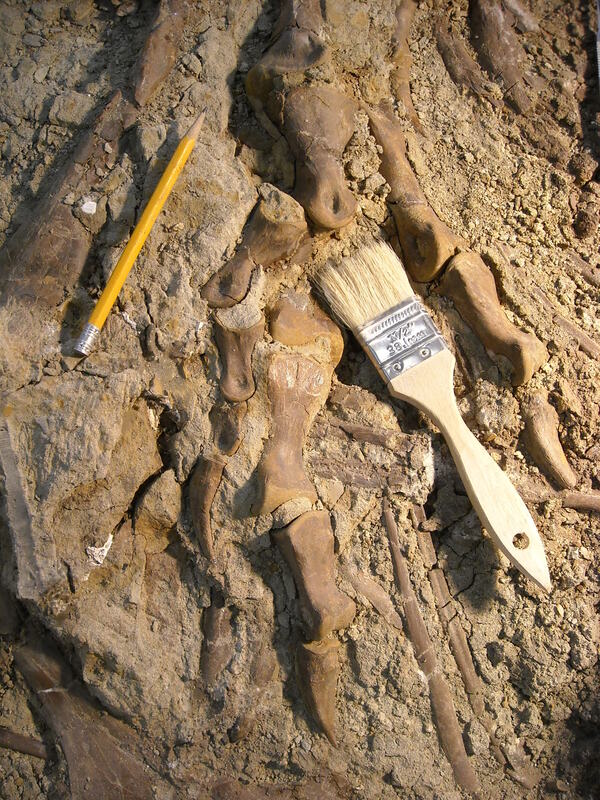 Techniques 1,2, 5b, and 6 were used on the Gorgosaurus‘s knee region on the 17th. The glue cured overnight and on the 18th the rock airscribed away. This eventually resulted in epoxy glue “dikes” appearing atop the cracked (but no glue-filled) bones and this was simply airscribed away until near the bone. At this point a sharp knife (#15 scalpel blade) was used to shave and trim the excess glue away. On the 18th, additional work around the fibula and cracked bone/rock there neccesitated my clearing a new work area. While brushing away loose matrix the extreme edges of three toe bones were found! These needed exposing and stabilizing so by the end of the day three complete toe bones and part of another were exposed. In one picture the plaster I poured in at the beginning of the project can be seen. 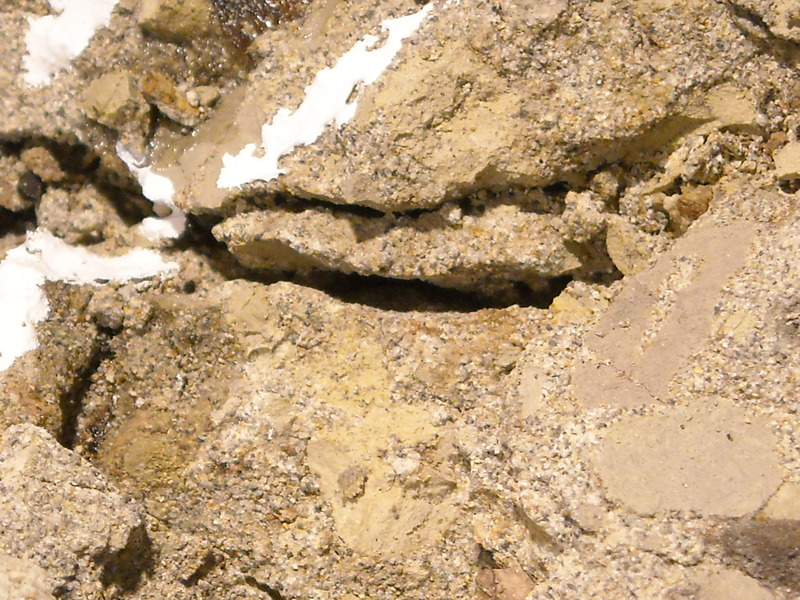 It flowed deep into the smaller rock cracks and held the rock pieces together. These toe bones were exactly where I predicted they would be. No I don’t have X-ray vision, but this is where an extensive lab and fieldwork background comes in handy. Tyrannosaurids often pull their limbs up towards their body as part of their “death pose”. The legs fold up into a compressed “Z”, much like a scissors jack folded up. 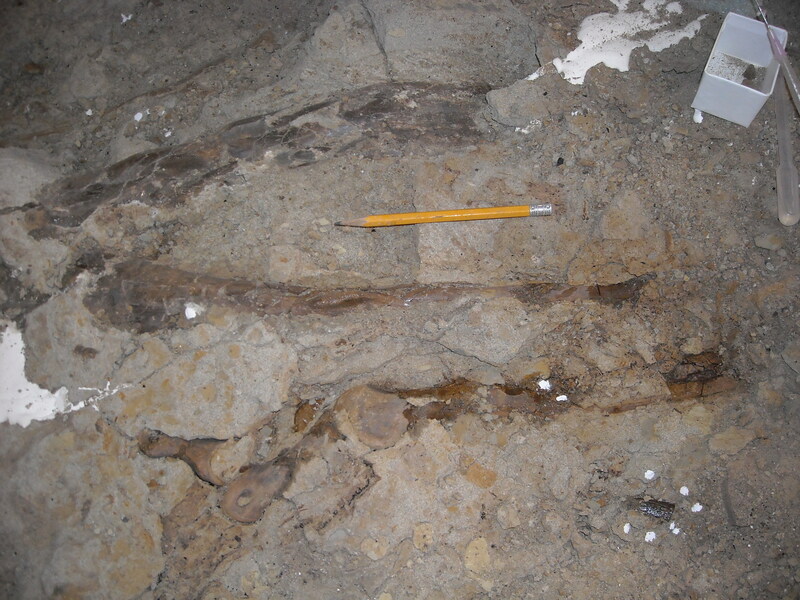 It is quite rare to find an articulated tyrannosaur femur and fibula together and not have a foot, so I was pretty sure the foot was there. 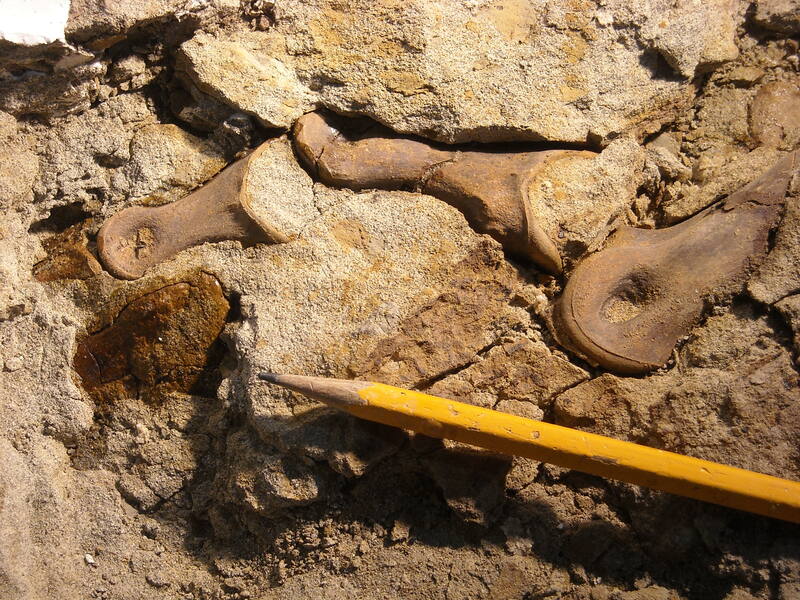 The tibia is still unseen, but it has to be there- most of the foot articulates to it. Without the tibia being there, the foot would fall off. In the field, once we had the pelvis, I was pretty sure there was a skull, as the head is often pulled backwards over the pelvis (more of the “death pose” again). That prediction came true as well. 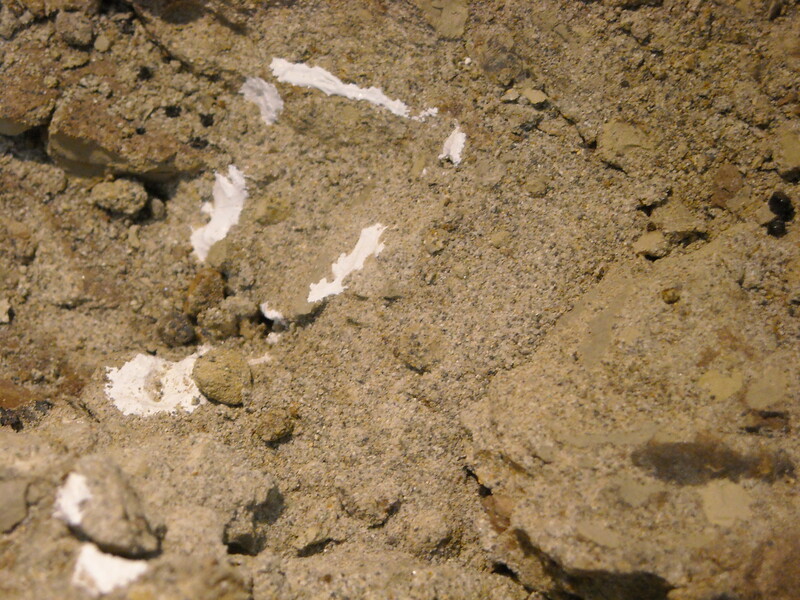 Another thing I predicted this specimen might have was evidence of healing bite marks and it did; that prediction based on the fact about 50% of small tyrannosaurids from Alberta show evidence of this. So experience is invaluable in the field and laboratory when working on these remarkable specimens. Work on the Gorgosaurus will likely slow down substantially now because the bone in the pelvic region appears to be very soft and crumbly, requiring much glue and glue drying time. Updates here may come now every 3-4 days, though I may fire off some brief fossil preparation tips from time to time. Don’t forget that the Royal Tyrrell Museum Facebook page has the daily preparation of this specimen posted there too, though postings there may slow down as well for the reasons above. Note: Darren and I are still looking for questions on the specimen and preparation techniques , their effect on research etc. We’ll answer them later this week in a special post. Just leave your question as a comment below. While I have been grilling all manner of palaeoartists (now collected here in a new Palaeoart category) other people have also been setting to some of my friends and colleagues. 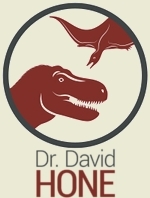 Over on the Open Source Paleontologist, Andy Farke puts the questions to Mark Witton about his new pterosaur paper, while over on Five Books, Paul Barrett talks about his favourite dinosaur tomes. Edit: Part 2 of the Mark Witton interview is here. 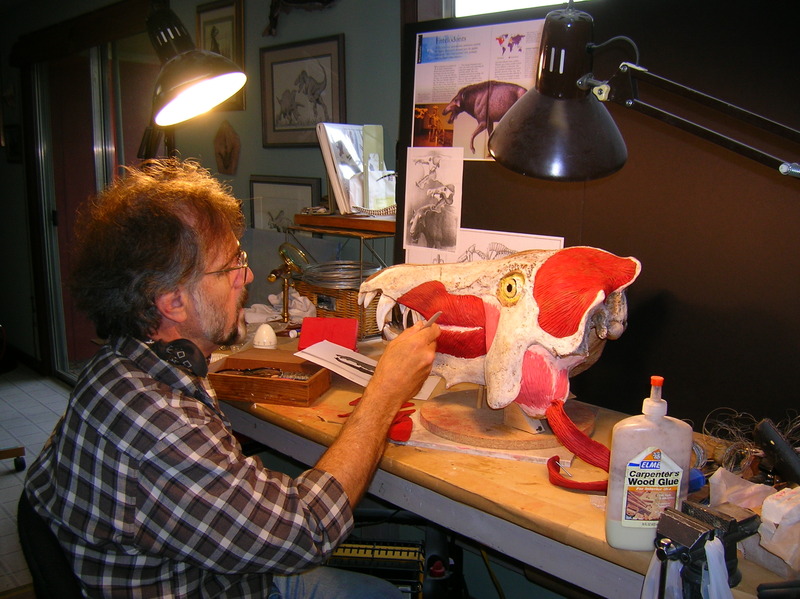 The latest in my line of palaeoart inteviews, (following hot on the heels of that from Mark Hallett) is with Todd Marshall. Todd first came to my serious attention at least thanks to his illustrations of pterosaurs in Dave Unwin’s book and as with these kinds of things, once I had my eye in for his style I realised how much of his stuff I had seen before. Here he takes us through his potted history of artwork before ending up ‘in’ dinosaurs and of course provides some of his artwork for your edification (his property, on loan of course etc. and more is on his website here). Guest Post: Bringing bird tracks back down to Earth. Today guest post regular Gareth Dyke talks about his recent work on a set of bird tracks from Morocco, alleged to be the oldest evidence for the avians. But things are more complex than they first appear….